I can understand why this film bombed in the box office when it was released but later gained a strong cult following. Even in today’s standards, this still has a very strong shock value because it features transsexual aliens, dirty images and songs, bad special and visual effects (it had a low budget), and a story that doesn’t make any sense. But I found this picture to be very difficult not to enjoy because it is aware of its campiness and shortcomings. I loved the fact that this movie made a plethora of references to the story of Frankenstein but it’s not limited to that. There are a lot of jokes in the background for comedic effect (whether it’s a painting, a banner, or an actor not realizing that he is on camera) even though those jokes are never attended to. It’s really up to the audiences to put some of the pieces together to truly enjoy this cult classic. Susan Sarandon and Barry Bostwick are believable as a WASP couple who gets engulfed in Tim Curry’s world of decadence. 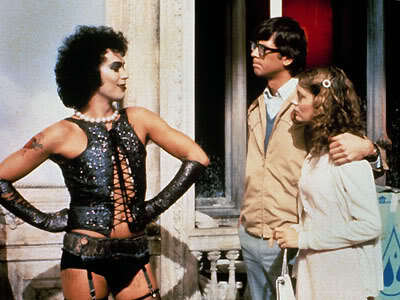 Peter Hinwood as Rocky Horror was really funny in his own mute way. Richard O’Brien (who also wrote the film) and Patricia Quinn provided an extra level of camp and originality. As for the songs, I found more than half of them to be very catchy especially “Dammit Janet” (which was sung in a church–it was hilarious), “Time Warp,” “Sweet Transvestite” and “Touch-A, Touch-A, Touch Me.” If you’re look for a film that’s kitschy, sarcastic and bold, this is the one too see. I think it has a solid place in cinematic history because I haven’t seen anything remotely like it.